Poll: What was your favorite feature of Exodus Season I? Poll: What do you want to be included in Exodus Season 2? What ever happened to season 3? Did it get posted and just not mentioned here? Or severely delayed? But not to fear, the beta for Exodus Season 3 will probably start in about 3 to 4 weeks. Likely very early 2017. The full release will then follow within about 2 weeks or so barring any major technical issues during the beta. I played season 2 first from seeing it on the yogscast and wound up going back for season 1 ages later. Those ages later being today! While I can see the areas where you've improved in season 2 (like the custom textures), this was an awesome remastered experience and just a load of fun. Except the moving platform parkour. That was fun until fail #37 or so. Amazing work. Me and my friend played through the whole map. Thanks for playing y'all! I'm glad you enjoyed. Exodus Season 3 will be out in about a month or so. Doing the last few touch ups and the beta will begin in about 2 to 3 weeks pending any major complications. Wow this looks amazing, can't wait to make a Let's Play on it! Looks great! :3 Can't wait to play. Played this with my friend. The loot-scavenging element was pretty cool, and so were the puzzles in Episode 3 (except at the moving parkour it took way too long to swim back up the waterfall). The zombie slaying did get a bit repetitive, and often there were so many it would lag. Also we both agreed that the penalty that clears your inventory is way too OP, but it was something surprising, and given the large quantity of loot around, I suppose it can be justified. Both of our ranks are Saviors of Humanity. If you want to include our heads in future maps (like how it says at the end of the map) our IGNs are Cavinator1 and MichaelMKenny. I'll keep my review summed up because I hurt my wrist trying to finish this in two sessions. --The voices started working, then the RP either broke or something 'cause the voices vanished. I was too lazy to redownload it, so my loss. --The very first room with zombies lagged way too much for some reason, which brought four deaths right off the bat because I just couldn't move. --A lot of the city was easy to beat by simply standing on a car and waiting it out. --Midgets...stupid midget zombies in chain armour. The random armoured mobs were actually tougher than the lab coated ones later. --And with that, the humour in some of the things like that was enjoyable. --I wound up using BAM to knock the final boss off the platform and onto the far ledge below where I proceeded to continually shoot it to death. It was...anti-climactic. --10/12 discs, no known reward/comment. Am disappoint. --12/12 chapters read. Best story. 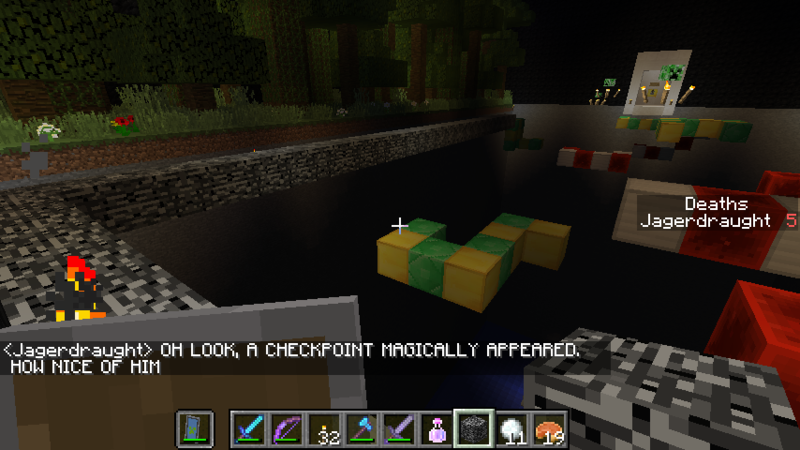 --An ungodly amount of skeleton traps spawned on the end game tour rails. Like, at least three with me seeing another three on the redstone. I switched to peaceful before dying twice from them. --God bless you before /fill and /summon. I made maps on the 360 and to the day know the pain (thanks, 4J). --I'm glad the ranks didn't include that "Oh, never die." nonsense. I'm surprised I got a perfect. All in all, a tad redundant, but nicely built and fun to explore. Would recommend as a standalone as I don't know how II and III tie in yet. Season 1 was originally designed to be a standalone map. But for Season 2 and Season 3 I turned the series into a much more story focused adventure. I'm glad you enjoy and check out my other maps! Thanks for playing! Hello! I download this map for my server and it seems that when I log onto the server the map doesnt load up, can you help? maybe cords? Hey! I noticed the map was released over on minecraftmaps, but not on the forums. Is there a reason why this isn't updated? Or are the minecraft forums simply too dead to bother with? Alright, I finished the first episode without too many lag problems, but upon entering the theatre, Minecraft crashed, and continued to crash on my attempts to reload it, with and without optifine. Though I can only guess at the number of heads in the audience, I can imagine it's excessive. It would be better to remove some or find a replacement, since the sheer number of them is game-crashing. Today is the Three Year Anniversary of Exodus Season 1!!! Wooo! Finally got a chance to play it through completely, and wow. Just... wow. It was very good. It was very well paced, had good combat, and the architecture was great. There's not a whole lot to talk about story-wise- That's not necessary in this situation. The dialogues were enjoyable (voice acting is always a plus!) and R3D kind of freaked me out (though I guess that's the point). Total: 17/20 - Pretty much perfect. Looking forward to the next three.